Division One newcomers Northants held their own against reigning champions Durham on an even day at Northampton. Durham elected to bat, and saw Michael Richardson (80) top score, but he fell sending a tickle off James Middlebrook. Paul Collingwood went cheaply, having returned from winter coaching duties, to Maurice Chambers (2-52), who also got rid of opener Keaton Jennings (54). Wicket-keeper Phil Mustard finished unbeaten on 63 with Gary Breese on 28 as Durham finished on 265-5. It was a solid start for newly-promoted Northants as Mohammad Azharullah knocked over Mark Stoneman's stumps in the fourth over to reduce Durham to 3-1. However, a masterful innings from Richardson, who showed his frustration at his soft dismissal, gave Durham a slight advantage up to tea. Not to be over-awed by the occasion, a fired-up Northants removed both Richardson and Collingwood in four overs to ensure they kept in touch with a slightly new-look, younger Durham side. "This wasn't a rude awakening for promoted Northamptonshire who battled gamely for most of the day and are still competitive against the County Champions. "On a pitch as flat as anything you will see in April, this was a good toss to win and Durham exploited it to the full, giving limited opportunities to the bowlers as the pitch dried out. "But Maurice Chambers' removal of Paul Collingwood with the second new ball showed his value on debut. 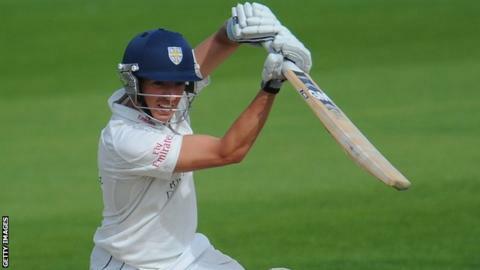 Northants need more from him first thing tomorrow morning if Durham are not to reach 400." "It was a slow first day between Northants and Durham as the visitors chose to bat on a wicket which didn't seem to offer too much aid to the bowlers. "Despite boasting three half centuries, Durham may also feel they have not capitalised fully as they closed the day on 265-5. "Michael Richardson top-scored with 80 and looked set for 100 before he fell to the spin bowling of James Middlebrook and was caught behind. "Keaton Jennings edged to the slips with an uncharacteristic shot while looking comfortable on 54. "Phil Mustard will resume day two on 63 and Gareth Breese on 28. Durham have to make sure they don't surrender their final wickets too cheaply against a weakened Northants attack. It is a long tail."